Various Artists – Off Track | Esc.rec. This release is also available via many other download and streaming channels, like Spotify, iTunes, etc. Check this Spotify playlist for many more Esc.rec. releases on Spotify. As a bonus (only via Bandcamp) this download includes a download of the original recordings of the four soundwalks conducted by Jeroen Diepenmaat, which were used as source material for this compilation and were released as a limited 4CD box. Thanks to all artists involved! This is a project by Jeroen Diepenmaat, Kunstenlab, Foundation Keizersrande, Esc.rec. and De Perifeer. 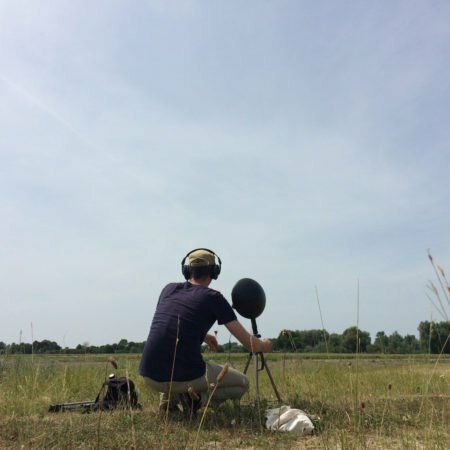 During the past year, four soundwalks took place at Keizersrande, a beautiful area just outside Deventer (NL), under the inspiring guidance of sound artist Jeroen Diepenmaat. At various locations a composition was created based on sounds from the landscape, collected with two directional microphones. Every season, a small audience could join the sound hunt. And after their walk they received the recordings of the landscape directly on CD. These CDs are now released in a very limited edition, issued as a 4 cd-box to make them available for fans who could not take part in the sound walks. But that is not all! In addition to this physical box, a digital compilation is released simultaneously, with work by eleven artists who have used the recordings of the soundwalks as source material. This compilation is entitled ‘Off Track’. Due to the varied processing of artists such as Francisco López, Machinefabriek, Les Horribles Travailleurs, Gluid, Michael Ridge, podL, Staplerfahrer, Teleferick, Vehikel, Nlus and BMB con., the original field recordings have gained a rich depth. Working methods range from the use of various tape loops to various degrees of electronic manipulation and using the sound of an electric fence as an unstable metronome. From adding and layering new sounds and sources to staying really close to the original recordings. The end result is a broad variety of captivating tracks which all in their own way mirror different parts of the recorded sound walks. The release is officially presented on June 21st, with live performances by Machinefabriek and Les Horribles Travailleurs, in De Perifeer and Kunstenlab.